SDM adventures is a family business, run primarily by Eli Martinez and his wife, Maritza Martinez. The goals of our company are simple, “to share with the world how important and beautiful our wildlife is, and to help dispel the predator myth.” ~ which is the belief that predatory animals are mindless monsters that need to be killed or culled. We organize wildlife photography expeditions all over the world, sharing with people wildlife as they should be seen; wild and free, living out their lives, in their own natural habitats. It is also through our expeditions and photography work, that we strive to help these important animals, with their bad PR problems. Based in South Texas, we began life as a publishing company. We published the first issue of Shark Diver Magazine, in March of 2003. Over an 8 year period, a total of 25 issues of SDM were published. During that time, we also organized expeditions to various places around the world, seeking out different species of sharks and whales. Our very first expedition was for sandtiger sharks off Morehead City, NC in May, 2003. As the years went on, we expanded these expeditions to include other wildlife; including apes, crocodiles, bears, wild cats and African Safaris. Sadly, the last issue of SDM was published in 2012. We recognized that social media was taking over the world, and a quarterly magazine just could not keep up with the speed of story telling on today's, social media platforms. However, we also discovered the benefits of these mediums. We could now connect daily with our readers and share all the latest news involving wildlife in real time. So, we decided it was best to do away with publishing our paper magazine, and focused our attention on the two areas we truly enjoyed - Story telling... using platforms like; youtube for video vlogs, facebook, and instagram. And of course our favorite; connecting with people in the real world, by organizing expeditions, helping people on their journeys - taking them to wild places to encounter, photograph, and learn about these amazing animals for themselves. Our work with sharks has varied through the years, from assisting with shark research, to documenting new and learned shark behaviors on our expeditions. 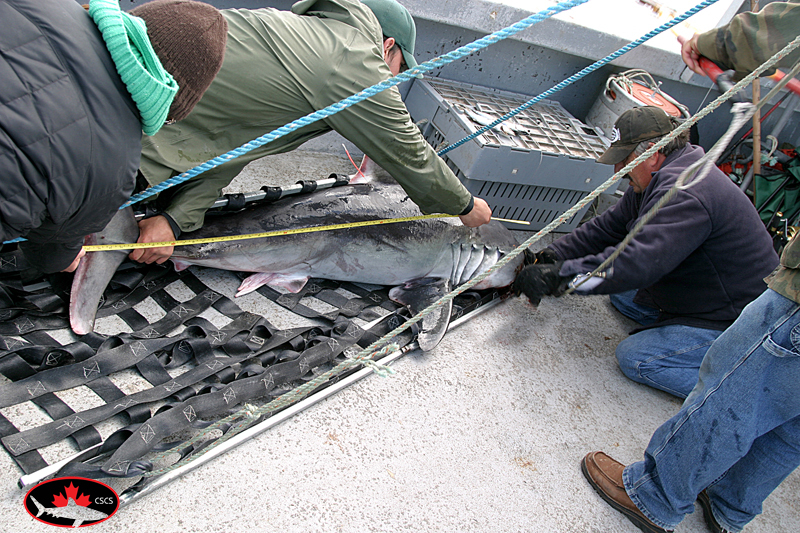 In this image, a Porbeagle shark is getting fitted with a satellite tag in the Bay of Fundy, Canada. We organized two expeditions that helped the Canadian Shark Conservation Society, learn more about this threatened species in the Bay of Fundy. Nothing was known about these sharks here, and the first two sat tags were deployed during these trips. The information from the tags proved that these sharks left the Bay, exposing them to commercial fishermen, and that more protection was needed to protect this vulnerable species. When we ran the magazine, we gave a voice to sharks by promoting their importance to our ocean's eco-systems and their importance to people and communities, ( through eco-tourism ). In our publication, we could share with the world the overfishing problems that sharks face globally, and the work being done to help protect them. Despite no longer publishing the magazine, we continue lending sharks (and other wildlife), a voice, by sharing these important messages on our expeditions, blogs, school presentations and social media pages. An important part of our work is documenting predator behavior on our expeditions. The information we collect via; notes, images and videos, is used to help people understand these animals, as well as help compliment researchers on-going work to protect these animals, along with their natural habitats. Our expeditions, which are very species specific, provide us with unique opportunities to learn intimate details about these animals. We spend a lot of time speaking to children at schools about the importance of sharks, and other predators. Sophia has begun speaking with them as well. We also spend a lot of time visiting schools to share our message. We have shared the predator’s story with tens of thousands of children through the years, sharing the importance of these animals and why we need them. It is through these talks and using our voice through TV, and social media that we can do our part to help give a voice to the voiceless...because only through love, respect, and education, will these predatory animals continue to exist in the wild. Thank you for reading and visiting our website. Eli is your trip leader on these expeditions. Growing up in deep South Texas, animals were always a part of his life. As the former editor of Shark Diver Magazine, his roots are deeply embedded in the shark diving community, pushing and helping to change what is known about sharks and the way they are seen. His love (or more accurately, his obsession), for animals and nature is where his heart truly lies and dispelling the “predator myths” is his life's work. He has spent countless hours under the sea photographing and interacting with different shark species, (logging over a thousand tiger and lemon shark dives alone), as well as countless hours in the field observing terrestrial wildlife; photographing and studying their behavior, trying to discover their true nature. He has worked as a host/cameraman/safety diver for; Discovery Channel's, Shark Week, Animal Planet, National Geographic, CNN, Outdoor Channel and NBC's The Today Show, as well as various documentaries, newspapers and magazines around the world. His TV show hosting work includes; SharkWeek's "Zombie Sharks." Nat Geo Wild's "Tiger Terror" and Outdoor Channel's "Blue Water Savages," series (8 episodes). Every wonder who was on the other side of your emails? Meet Maritza, the first person you will encounter from the SDM family. From responding to your emails, to arranging your trips, transfers, hotels...etc. She provides the help you need to ensure your expedition is a success and headache free. When she is not in the office, helping organize the trips, she is with you, out there, co-hosting the expeditions with Eli. Stay updated with her instagram, and check out all the latest adventures. David is the latest addition to our team. He is our scuba instructor and safety diver. He is currently working this season at Phantom Divers, in Playa del Carmen, Mexico, honing his skills as a shark feeder and dive guide. He officially joined our team in January, 2014. Helping us to lead SDM expeditions whenever he wasn’t off on his own adventures. In 2015, David worked as a cameraman / safety diver for the Outdoor Channel’s TV series, Blue Water Savages (2015). You can follow David's adventures on his Instagram and Facebook account. Sophia is 13 years old, born in Mcallen, Texas. Raised in this world, naturally Sophia was born with a deep love for wildlife and the outdoors. She spends a part of her year, helping to crew SDM’s expeditions, learning about conservation and working on her photography. Sophia began traveling with her parents on boats, at the age of 5 years old. Sparking Sophia's passion for wildlife, and the need to protect them. She decided pretty quickly that she wanted to become a wildlife photographer, specializing in aquatic and predatory species, such as wildcats, wolves and bears. Seeing the love she shared, her parents decided to homeschool her, bringing her on every trip that was available. She became a certified diver at the age of 10 and has been crazy about diving ever since… she hopes to increase the awareness and appreciation of our natural world through her photography and story telling. Her photography is of animals in their natural environment. Roaming wild and free, is the only way she wants to capture images of them. Her work involves tight close-ups as well as a study of animals in their natural environment. You can follow her never ending adventures on her Facebook and instagram pages.